Home › Life's Lessons › How Resilient Are You In Your Quest to Find Your Mate? Dating takes a thick skin. Think of yourself as a baseball player who comes up to bat at home base. Just because you strike out, doesn’t mean that you give up. You learn from that experience. You would adjust your stance; try to learn more about the pitcher and what kinds of pitches he will be throwing to you. You start working the percentages and eventually, you hit a single and run to first base. And perhaps if you keep at it, you will get a home run! However, if you walk away from the ball game before the end, you will never know if you can hit that home run. The resilient person looks failure squarely in the face and continues to persevere. Resilient people deal with rejection in a healthy way. They understand that not everyone is the right match and are able to move on quickly. I had a saying, “You are just not my cup of tea!” You want to find someone who has the capacity to love and truly appreciates them. No one likes to be rejected and some of my clients find it really hard to be in a position to reject someone. However, in the long run, it’s best to let someone go and find their better match. I was working with a 45 year old divorced business owner (and single parent with mostly grown children) who is getting back into the dating world after a recent bad break up. She had some trepidation about having to deal with rejection. I reminded her that, “You are a business owner. Don’t you deal with rejection all the time? How is it when someone doesn’t buy your service?” She answered, “Either the person is not ready to make the investment or it’s not the right fit for this potential client.” I challenged her to relate this mindset back to her dating. Resilient people forgive themselves for making poor choices. They understand that they did the best they could to make the right decision about a past long term relationship or marriage. They understand they are now older and wiser. I also tell myself, “I won’t make that mistake again. However, I most likely will make some new mistakes!” It’s about having kindness and compassion for yourself. Resilient people understand you can’t change the past and you only have the present and the future ahead of you to make better choices for yourself. Once you learn the lessons from your past choices, then dwelling on your past relationship failures does not serve you. Time is too precious. They are ready to take action that will move them forward to find a mate. Many of my clients who I would categorize as resilient see no choice other than to continue on their quest to find their mate. They do face disappointment and get frustrated like everyone. However, they do learn how to adjust their search in order to better their chances to connect with the right one. They change some aspect of their dating process or their life until they can find that special person with which to have a loving, fulfilling relationship that they truly desire. I have clients who have worked with me for over a year. They are improving their lives, continue to be interested in learning and also are creating opportunities to attract the right people into their lives. They have had relationships that were close and not quite the right ones. And yet, they continue to persist in their quest to find a mate. How can you know if you are resilient? Think about your past relationship history. When you break up with someone, how long does it take you to get back out there to start meeting someone new? Are you still pining away for some past boyfriend or girlfriend that clearly is not there for you? Keep that sheet handy for when you start looking backwards and not forwards to remind yourself why that relationship just can’t be. And then, resolve to take some positive actions to get out there and meet some new people to date who are a better fit for you in the long run. And last, as a resilient person, you have the belief that the right person is out there for you to meet that will be just who you were looking for. What is your experience with bouncing back after a break up? This curious coach would like to know! Please leave a comment below. PS. 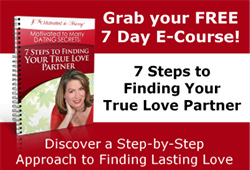 If you want to learn some of my strategies and tips for Motivated to Marry dating, go to www.motivatedtomarry.com and grab my FREE 7 Day E-Course to find true love! ‹ Who accompanies you to your single’s events to find love? Thank you Amy for highlighting this issue. It is so true that when you are in the dating game you have to learn to be resilient, grow a thick skin and dust yourself off to get back out there if things do not work out. By dwelling and ruminating you achieve nothing and just take yourself further away from your goal of meeting someone. Each and every one of us had to learn to walk and we never gave up the first time we fell over and to me I guess that is how I see the journey of finding that special someone. ourselves in the places we will connect with the right one. Agreed, often people do the same things all of the time and do not adjust but expect a different result.